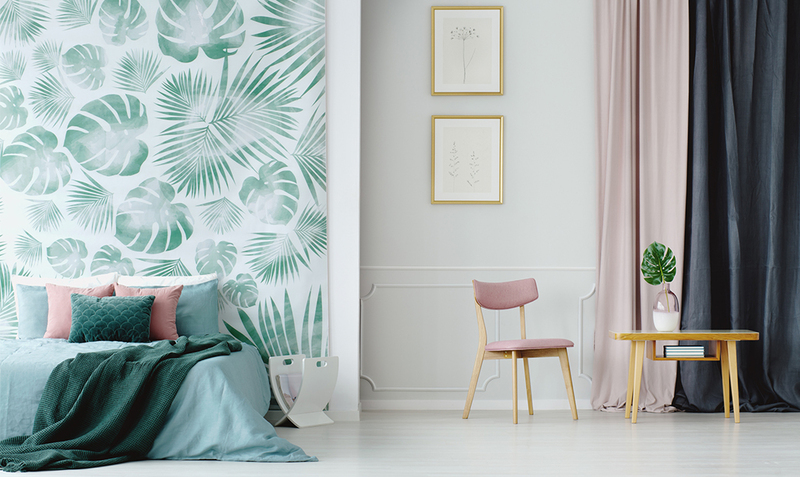 For some wallpaper might seem like a scary word, for others it’s a cause for excitement and a reason go by the motto “you can never have too much of a good thing”. Perhaps wallpaper makes you think of your granny’s house in the 80s, with lino floors and patterns galore? But it doesn’t have to be that way. Wallpaper can add a really nice creative touch to your home, even if you’re adamant that walls should be bright white only. That’s why we’ve sourced 9 creative ways to use wallpaper whilst your walls remain white. We love the idea of using wallpaper on a staircase – if you have one in your home of course. The effect from afar is striking and then as you walk up you can take in the pattern. Turn it from ordinary to extraordinary just by adding some paper to the panels behind. You’ll have an instant facelift and it’ll feel like a brand new piece of furniture. A photo wall conjures up an eclectic mix of photos, large and small. But what if you could make a wallpaper out of your Instagram pictures? If you want your walls to stay white but love the effect of bursts of colour and patterns, why not try wallpapering the ceiling instead? Now, when you think of a kitchen splashback you probably think of tiles or a bright mono colour. But wallpaper can create a dramatic and eye-catching feature in your kitchen. There’s even something that’s perfect for renters. It’s Peel ‘N’ Stick removal wallpaper and can be used to cover over any kitchen or bathroom surface without damaging anything. If you’re looking to change the room a little, or really want to add a splash of colour without changing the colour of your walls, then kitchen islands or breakfast bars are a great way to start. If you don’t want to make it permanent, you can use the removable paper here as well. Great for when you’re renting but still want to create your own space. If you have an old and unassuming fireplace in your home, wrapping it in wallpaper like this one from Desire to Inspire will create a striking feature for any room.